TORONTO (AP) — Milwaukee coach Mike Budenholzer and his staff are heading to the All-Star Game. 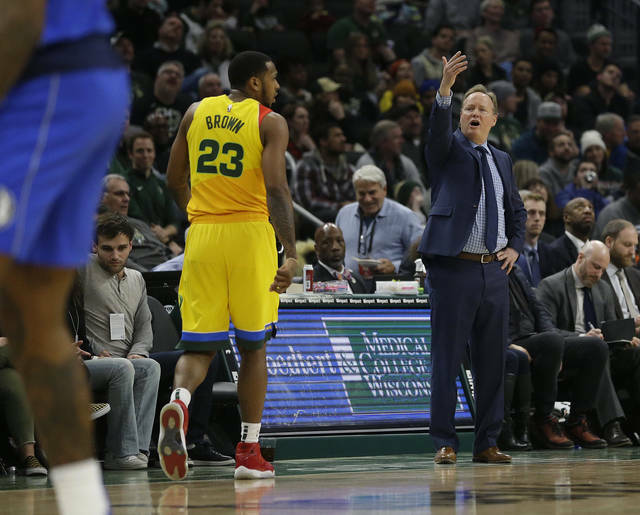 The Bucks’ 105-92 win over the Toronto Raptors on Thursday night clinched the spot for Budenholzer, who will coach in the All-Star Game for the second time in five years. He also coached in 2015, when he was with the Atlanta Hawks. Milwaukee improved to an NBA-best 37-13 with the win. Toronto fell to 37-16, and the loss means its first-year coach Nick Nurse now cannot overtake Budenholzer in time for the All-Star job. It goes to the coaches of the teams with the best record in the Eastern Conference and the Western Conference through Sunday’s games. Budenholzer will coach Team Giannis — the one captained by Bucks star Giannis Antetokounmpo. Milwaukee’s Khris Middleton is also heading to the Feb. 17 game in Charlotte as a reserve. Middleton will find out which team he’ll play for on Feb. 7, when Antetokounmpo and LeBron James, the other captain, select their teams. Budenholzer is only the second Bucks coach to earn the All-Star nod — Larry Costello coached in the 1971 and 1974 All-Star matchups. The West coach will be either Golden State’s Steve Kerr or Denver’s Michael Malone. Kerr would be the All-Star coach for the third time in the last five seasons, and he faced off against Budenholzer in the 2015 game. Malone has never been the All-Star coach, and would be the first Denver coach to have that job since George Karl in 2010. NEW YORK (AP) — The New York Knicks were having their doubts, wondering if Kristaps Porzingis truly wanted to be part of the franchise. BATON ROUGE, La. (AP) — Arkansas coach Mike Anderson couldn’t help but rave about his team’s poise, even though the Razorbacks had blown an 18-point lead during the final 13 minutes. Daniel Gafford scored 23 points and Isaiah Joe added 18 points for the Razorbacks (13-8, 4-4 SEC), who trailed three times in the last 3:39, but responded with points each time to halt LSU’s streaks of 18 straight victories at home and 10 overall. Joe hit two free throws with 3:27 to go and Gafford scored his final points in the paint with 3:01 left — each basket putting Arkansas up by a point before Jones reached 10 points on the game’s final basket. Naz Reid had 19 points and 10 rebounds, and Javonte Smart scored 18 for LSU (17-4, 7-1), which was trying to start 8-0 in the league for the first time since 1981 — and very nearly did. But neither team scored again until Jones used a head fake to drive past LSU guard Tremont Waters — shortly after Waters had turned the ball over on a risky alley-oop lob intended for Marlon Taylor as Taylor cut along the baseline. “Very disappointed we couldn’t pull it out,” LSU coach Will Wade said, adding that his team had been “cruising for a while” and could only expect to get away with it for so long. “When you walk a tight rope — we’ve been walking a tight rope for about two weeks — you’re eventually going to fall off,” Wade said. The Tigers had three shots on their last possession. Smart rebounded Reid’s missed layup, but missed a pull-up jumper. Reid corralled the next rebound while moving away from the basket and his off-balance 3 fell short as time ran out. “We need to play hard from the jump and not wait until the end of the game or when we are down,” Reid lamented. Arkansas took its largest lead, at 66-48, when Reggie Chaney’s dunk with 13:45 left capped a 10-0 run that also included five points from Adrio Bailey on two free throws and a 3. But a packed crowd at the Pete Maravich Assembly Center responded shortly after by roaring to urge LSU on. The Tigers chipped away and took their first lead since early in the first half on Smart’s off-balance finger roll with 3:39 left. Keyshawn Embery-Simpson tied a career high with 16 points for Arkansas, hitting four of his team’s 13 3-pointers. Joe also hit four 3s, giving him 73 this season. Arkansas shot 54.2 percent from 3-point range (13 of 24) and hit a number of timely mid-range jumpers, as well while shooting 58.3 percent overall (35 of 60). Arkansas: Good shooting was narrowly enough to overcome LSU’s 25-point advantage from the foul line and 44-20 advantage in rebounds. The Razorbacks have won three of four, providing hope for a strong finish to the regular season. LSU: The Tigers, who won at Arkansas in overtime earlier this season, nearly came back by using their athleticism and imposing their will inside. They lost the game by losing track of Arkansas’ best perimeter shooters and because of their own struggles from 3-point range, where they shot 20.8 percent (5 of 24). They also turned the ball over a season-high 21 times. Skyler Mays scored 17 for LSU and Waters finished with 12 points, eight rebounds and six assists. Kavell Bigby-Williams scored 10 points. Disclosure statement: Victor Odundo Owuor does not work for, consult, own shares in or receive funding from any company or organization that would benefit from this article, and has disclosed no relevant affiliations beyond their academic appointment. Museveni, his minister of finance, and other government officials assert that online sports gambling is diverting the attention of young people from hard work. Jon Richfield, logged in via Facebook: I am no gambler myself (I hate losing more than I like winning), and if you stopped gambling entirely, never mind sports gambling in particular, I would never complain, but good luck to you. And never mind whether you used legal sanctions, or religious principles, or education; you would stand a better chance of stopping drug abuse, including smoking and drinking. EDINBURGH, Scotland (AP) — Italy reached a new low in its woeful Six Nations history by losing at Scotland 33-20 for an 18th straight defeat in the championship, breaking a century-old record on Saturday. Kinghorn was the main reason for that, the winger scoring Scotland’s first hat trick in the competition since Iwan Tukalo against Ireland in the Five Nations 30 years ago. After Tommaso Allan gave Italy an early lead with a penalty, Scotland responded as Finn Russell floated a perfect crossfield kick into the hands of Kinghorn, who darted across the line unchallenged. Kinghorn had more work to do nine minutes later but the result was the same as he again pounced in the left-hand corner. Tommaso Castello’s knock-on gave the Scots a scrum five yards out from which they quickly worked the ball out wide through the hands of Russell and impressive debutant center Sam Johnson. Stuart Hogg did Kinghorn no favors with a terrible pass that landed under his feet but the pick-up and finish was impeccable. Greig Laidlaw, who missed his first conversion, nailed the extras from out wide but Scotland failed to keep their foot on the gas and that gave the Italians some much-needed respite as they held on for the halftime whistle trailing 12-3. However, the Dark Blues’ show of mercy lasted just seven minutes into the second period as Hogg added the third try. Winger Tommy Seymour carved the Azzurri apart with a marauding charge and as the visitors scrambled for cover, Russell dinked a grubber in behind. The race was on between Hogg and Esposito and it was the Scotland fullback who applied the all-important downward pressure with his fingertips. Laidlaw’s conversion opened up a 16-point lead but the bonus point was the prize Scotland was really after and it arrived in the 54th as Kinghorn wrapped up his hat trick. Russell did brilliantly to scoop up a wayward pass from Josh Strauss. Ritchie then rammed forward with another impressive run before Laidlaw handed off for Kinghorn, who slid over yet again. Replacement back Chris Harris then claimed his maiden test try just after the hour mark as good work by Ben Toolis and Strauss left Italy creaking again. Some of the shine was taken off Scotland’s win as they fell asleep in the final 10 minutes, however, following Berghan’s yellow card.